It would be nice if our community website could be shown by more than one language. It seems not so hard if use Google Translate's Tools and Resources. Please refer Add Translate to your website. Qruqs	 I don't think on-line translation services aren't mature enough to use. They're a help, but no replacement for a real translation. Each to his or her own, I guess, as long as the site maintainers never will fall for the hideous mistake many do: set the language on the pages based on your IP location! That must be one of the worst ideas ever to have come out of somebody's brain. There is NOTHING AT ALL that says a person can even understand one word of the language being served! We have people who live and work in Sweden and who can't understand a word of Swedish, yet they are by default served Swedish when they use "services" like google, IMDb (film names) or others like them, no matter what their browser setting is. Why? For the same reason one should not use a country's flag to stand for a language. Why should a person who lives in Canada, and who only speaks French, have to click on a French flag to read his or her Canadian mother's tongue? There is nothing wrong with having translated sites, if they're well put together (IMO, most aren't). But let it be a choice you can make! The world has had enough dictators! Mutual understanding is a great thing! kazztan0325	 Thank you @vincentv for your understanding and putting this forward. I understand your situation, and accept your apologies. Nobody is skillful at the start. I guess you are a good moderator in Mint Forums, but I think you should heed the circumstances that the moderating job in Mint Community website is a bit different from the job in forums. I hope, you would learn the ropes as soon as possible and would become a good moderator in this community also. Did you understand the contention which I wrote on my previous comments? I would like to ask you to undo your decision. If you could not understand the point, then I (and maybe other members also) would not be able to get away from the fact that you do not have a vocation for moderating in this community. Tonya	 These two ideas goal is similar, but the way and means are different. I agree with @kazztan0325 that it will be good if Mint Team would make final decision. Please read @efthialex 's "Translating community.linuxmint.com" and mine closely and compare these two ideas. > I can translate it in Greek. That is to say, @efthialex suggests translation with members hands. On the other hand, I suggests machine translation, though it has not matured yet. So two ideas are similar, but its way and means are different each other. Anyway I cannot accept your decision, but I don't allow you would reject @efthialex 's idea. I think both of two are worthy to consider. I hope Mint Team would make last decision (Approved or Rejected). I don't intend to stick to Google's Script/API, it's just a sample. I don't mind what way and means would be used to realize this idea. Please consider the intention itself of this idea and decide it should be put forward or not. I'm sorry I replied to you too late. jose_manuel	 Very Good Idea !!!! I Promote this !!!! "it should be done already!" But this idea's Status is still 'New'. Maybe it would be changed to 'Considered' 1 wear later...? kip-	 Its only small piece of code from google pasted in to header of website and job done.. it should be done already! You need not remove your idea. The last decision "to be considered or to be rejected" would be passed by Moderators, not by us. mitcoes	 Of course I promote your idea, sorry for not finding this before my own. I am interested in the accuracy of translation by comparison Ukrainian and Japanese. It seems they have many difference of the results. It would come from the difference of 'language family'. Maybe Italian would have many difference of the results between Ukrainian, Italian, and Japanese. Anyway the accuracy of machine translation is still low at present. We should not depend on machine translation thoughtlessly. And I agree with your suggestion. I think, we should mainly use English for both reading and writing, we may refer machine translation but it is only when we are under the necessity of using it. 5,6,7 - translation of the strange and senseless. Original did not help - I could not understand this game of words. Of course I can spend much more time and decipher the message. These were cases when I knew about the complexity of sentences and the probable error of an interpreter. However when I do not know about a possible bug I have more confidence in the translation. Probability of error is high. It's one thing when these errors appear when translating the private blog. Most likely it will cause some jokes and no more. But when these errors will show up in the discussion complex technical issues it will cause serious errors, mutual accusations of incompetence, taking wrong decisions. In my opinion the presence of full-page automatic translation, many members will be less careful approach to translation, is less to analyze the original text, more rely on low-quality translation. This will increase the error rate. Also, as a consequence - increase in irrelevant messages, and false interpretations. On the other hand judging from the reviews here many community members consider this feature useful. - For writing: that is necessary to express himself simply and clearly, without excessive linguistic acrobatics. And so I changing the rejection of this idea to support it. kazztan0325	 Thanks again, @compuman2004 ! We select Language, then Google translate bar will appear as we can see in the second screen-shot. By the way, @Alexio, can we put the Language Selector of Google translate at the top-right on our site? I'm interested in Ukrainian alphabet too. Alexio	 I am also supporting this idea as I already implemented the Google Translate functionality for the Linux Mint Community Videos website. 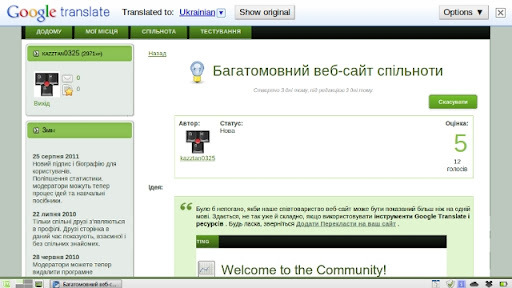 Many thanks for using Ukrainian in your assignment (homework) and in screen-shot. I believe machine translation would become a little help for our community, though we should use it carefully. I guess almost all of languages in the world have 'homonym'. For machine translation, it would be one of issues which should be managed well. And we can see machine translation is under developing at present while we are looking at the results of the assignment (homework) which you gave me. "... with the disclaimer printed in BOLD at the top of the translated page that any machine translation can be incorrect, and not to use it with instructions that could damage your machine if translated incorrectly"
blueXrider	 Yes, it is a difficult task to undertake. It would mean a lot more support from the community or at least more moderators. Good job @kazztran0325 on your "assignment" however it wasn't ment for you to post the results. Very interesting though. Our English is made of fragments. Same spelling=different meanings, words sound the same=different meanings. mikefreeman	 I've always thought that the main site (www.linuxmint.com) should be a more static, general information and promotional site, and the blog listings should remain on the blog. That would make the main page translation into other languages significantly easier. Also, with our ideals of open source community involvement, maybe we can offer our services to the Mint team in that same spirit. Basically, if you are fluent in English and your non-English native language that you'd like to see the Mint website in, perhaps you could copy the html from the main page, translate the text into your native language, perhaps let someone else peruse and edit any mistakes, and send those files to the Mint team for review and possible addition to the site. From there, the more fluid parts of the site (like the blog, forums, community site, etc.) can have your translation button on them with the disclaimer printed in BOLD at the top of the translated page that any machine translation can be incorrect, and not to use it with instructions that could damage your machine if translated incorrectly. Or something like that. Actually I did't understand the word 'rotflmao', so I referred http://www.urbandictionary.com/define.php?term=ROTFLMAO, then I understood. I'm glad to make you "roll on the floor laughing my a** off". Can0dope	 rotflmao! "You said Nantes"
I think your idea "The best thing one could do for tutorials would be have a sort of wiki and let users tranlate the articles" is very good. What about posting it as your idea? We should not thoughtlessly use machine translation for tutorials. By the way, I'm interested in the game which you introduced us. Where did 'Nantes' come from?? I hope you would continuously come to community if possible, because you are a senior member in our Japanese members. I also think Mint Main site should be translated by human's brains and hands. In Community site, if machine translation would be implemented, it would give us a little help when some members posted ideas or tutorials in their mother tongue. By the way, I have heard the name 'Doctor Who', but sadly I have not watched the SF TV programme. I used to watch 'Thunderbirds' of my childhood. Built-in Google Translation would become a little help for our life in this community. This assignment (homework) was very interesting to do. I translated example sentences to Ukrainian (the 2nd line), Japanese (the 3rd line) and Italian (the 4th line). May I ask @Gurman to rate the accuracy of translation about Ukrainian? May I ask @L0r3nz0 to rate the accuracy of translation about Italian? Needless to say, I rated the accuracy of translation about Japanese, and wrote it at below this report. The criterion of rating is as below. B = Translation of words and phrases are OK. Grammatically unnatural or strange, but I understand what does it mean. C = It has mistranslation of word(s) or phrase(s). Grammatically unnatural or strange. But I guess vaguely what does it mean. D = It has mistranslation of word(s) or phrase(s). Grammatically no problem, but it is useless. E = It has mistranslation of word(s) or phrase(s). Grammatical mistranslation. It is useless. 1) Пов'язка була намотана навколо рани. 1) Il bendaggio è stato avvolto intorno alla ferita. 2) Ферма використовується для виробництва продукції. 2) L'azienda è stata utilizzata per la produzione di produrre. 3) Звалище була настільки повною, що їй довелося відмовитися ще відмовитися. 3) La discarica era così piena che ha dovuto rifiutare più rifiutare. 4) Ми повинні польський польська меблі. 4) Dobbiamo lucidare i mobili polacco. 5) Він може призвести, якщо він отримав би вивести. 5) Si potrebbe portare, se avrebbe ottenuto la conducono fuori. 6) Солдат вирішив покинути його десерт в пустелі. 6) Il soldato ha deciso di abbandonare la sua dolce nel deserto. 7) Так що немає часу, як сьогодення, він подумав, що настав час представити даний час. 7) Dal momento che non c'è tempo come l'attuale, ha pensato che era giunto il momento di presentare il presente. 8) Бас був написаний на голові бас-барабана. 8) Un basso è stata dipinta sul capo della grancassa. 9) Коли стріляють, голуб пірнув у кущі. 9) Quando sparato, la colomba colomba in mezzo ai cespugli. 10) Я не заперечував, щоб об'єкт. 10) Non mi ha contestato l'oggetto. 11) Страхування є недійсним за недійсними. 11) L'assicurazione è valida per il valido. 12) Існував ряд серед веслярів про те, як рядок. 12) C'era una fila tra i rematori sulle modalità di fila. 13) Вони були дуже близько до дверей, щоб закрити його. 13) Erano troppo vicino alla porta per chiuderla. 14) Долар робить смішні речі, коли дійсно присутні. 14) Il dollaro fa cose strane quando le fa sono presenti. 15) Швачка та каналізаційних впав у каналізаційну лінію. 15) Una sarta e una fogna cadde in una rete fognaria. 16) Щоб допомогти з посадкою, фермер навчив своїх сіяти сіяти. 16) Per aiutare con la semina, l'agricoltore ha insegnato ai suoi seminare a seminare. 17) Вітер був дуже сильний, щоб вітром вітрила. 17) Il vento era troppo forte per il vento la vela. 18) Після декількох ін'єкцій моя щелепа отримав номер. 18) Dopo una serie di iniezioni mia mascella ha numero. 19) Побачивши сльози на картині я розплакався. 19) Dopo aver visto lo strappo nel dipinto ho versato una lacrima. 20) Я повинен був предметом підлягають ряд випробувань. 20) Ho dovuto sottoporre il soggetto ad una serie di test. 21) How can I intimate this to my most intimate friend. 21) Як я можу інтимної це мій найближчий друг. 21) Come posso intima al mio amico più intimo. I think we need to consider the words and phrases which are used in our community are restrictive. i.e. Probably it is impossible the sentences like these would appear in our community site. In principle, this is a good idea. In practice I wonder if machine translation is good enough for tutorials where you need to know what you are doing. In theory c' ; an good idea is. I wonder in practice if the automatic translation for d' ; course it is rather good; Instruction, where you must know what you made. L0r3nz0	 I agree with @RayWoods and @trollboy, both the main mage and the tutorial section shouldn't be automatically translated. The best thing one could do for tutorials would be have a sort of wiki and let users tranlate the articles. trollboy	 There was a game that could be played with Alta Vista Babrlfish where you would translate a simple sentence through a few languages and back for example English -> French -> german -> Dutch -> German -> French -> English to see what gibberish you would get back. Awesome game and with machine translation it is still just as playable today. I also know machine translation is under developing, its accuracy is not so high, but it is possible to be a little help. There are some members who post ideas (or tutorials) which are written by their mother tongue. In these case, what do you do? Do you ignore them because you don't understand their language? The answer is..., "NO! ", right? I guess you would translate them to your mother tongue (or English) with machine translation, and you would almost understand what would they like to say, and then you would vote or would add comments, right? If the function of translating engine would be incorporated into this site, you would need not coming and going between this site and translation site. And the members who are not good at writing English would feel free to post their ideas (or tutorials) which are written by their mother tongue. orionthehunter	 Google Translate is improving to the point where I think I might actually support this. RayWoods	 A few years ago, on finding a foreign language, you just clicked onto another page. Now we can translate it and normally gather the gist of what is being said. What is it going to be like in the future? May be not like in the BBC's Doctor Who, where the TARDIS translates everything, (including lip sync), but it should improve. 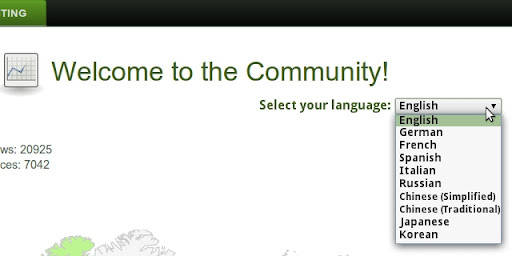 Linux Mint is not just an Anglo Saxon phenomena (in English) but is truly international. Because of this, I think, at least the main pages should have specific translations done, leaving the rest to automated translating machines. You have my support @kazztan0325. Tonya	 I support this idea. Do you like machine translation or not, are you satisfied with machine translation quality or not... built-in Google Translation should ease our life anyway. The idea is good. But practically unrealizable. As I said before, do it by hand is unrealistic. A machine translation is so bad, that will give more confusion than good. I know whereof I speak. I use Google Translate to write this comment. I use it daily for other tasks. Because I speak English too bad. Each time I have to recheck everything carefully. Translation engine - only help in the translation. Neither engine is not able to fully translate. Very often the translation is so weird that you can not make out what they mean. Thank you for your support and sample. The comments in Japanese which you translated by translating engine is not 100% complete and is a little strange, but we Japanese understand what you would like to say. If we have to start to translate entire website by our brains and hands, I would not post this idea. Only use of the function of Google Translate, our community site would become one which is easier for users who are not good at English to browse. By way of parenthesis, I am NOT a participant of ©Google (smile). Did you see Add Translate to your website ? Just copy and paste their snippet of code (it has only 7 lines) into webpage, it could translate the entire webpage. However it use the function of Google Translate, so it would be impossible the translation would be 100% complete. But it need not translate entire webpage by hand. It's unreal the amount of work. It is better to direct these efforts to create and maintain individual websites of local communities. but I try - this is a tribute to the overall efficiency.